Suffering through a prolonged period of frustration and despair, the Penn State football team faces a do-or-die moment in an early Big Ten contest: Trailing in the fourth quarter and needing an unlikely game-extending play to keep hope alive, the Lions thread the needle, capping off a precarious come-from-behind win with an explosive score from their star playmaker. This escape turns a potentially season-unraveling disaster into the catalyst for the program’s return to glory. Two weeks later, following a blowout home victory, the Lions score a destiny-altering upset win over a highly-ranked Ohio State team under the lights, sealed with an unforgettable play sure to grace highlight reels for years to come. The team then blossoms into the sort of powerhouse that recalls Penn State’s tradition of gridiron dominance, quickly obscuring memory of a decidedly lackluster recent past. The denizens of Nittany Nation are treated to one of those unforgettable Autumns for the ages – everything from merchandise sales and hotel reservations to alumni donations and season ticket renewals pick back up – as Penn State cruises to an improbable conference crown, one made all the sweeter for just how completely unlooked-for it was before the season began. While that passage perfectly describes this year’s exhilarating football season, it applies equally to another unexpected comeback campaign from a decade ago, when the 2005 Nittany Lions rescued the program from its early-decade doldrums. Back then, it was Derrick Williams scoring on Northwestern instead of Saquon Barkley against Minnesota. This year, Marcus Allen and Grant Haley combined for the Ohio State game’s signature play rather than Tamba Hali and Scott Paxson. After back-to-back uninspiring seasons with identical winning, but underwhelming records, grumbling and skepticism about the head coach is bubbling to the surface with increasing frequency and volume. Into the fold steps a dynamic, but previously unheralded dual-threat quarterback who’d shown the first hints of his potential in the team’s last bowl game. He replaces a multi-year starter, a prototypical pocket passer (wearing number 14) who arrived on campus as an elite recruit, but went on to frustrate and confuse observers with on-field struggles. Despite lacking his predecessor’s recruiting star power, the young man proves to be a heady winner, running and passing his way into the school record books and fans’ hearts as he commands a potent offense that leads Penn State to the Big Ten title, but the bittersweet finish of a Rose Bowl loss to USC. Did I just describe Daryll Clark succeeding Anthony Morelli for the 2008 Nittany Lions or Trace McSorley’s ascension following the rocky tenure of Christian Hackenberg? Appropriately for this age of the remix, the mashup, and ‘The Force Awakens,’ parallels and callbacks to the past abounded for Penn State this year, as a new generation of Lions inspired nostalgia for the program’s winning ways. Although 2016 was an up-and-down year for Old State’s defense, in its brightest moments, the unit seemed to channel the very best of their predecessors, such as the stalwart 1986 national champions (right down to linebacker Jason Cabinda’s neck roll). 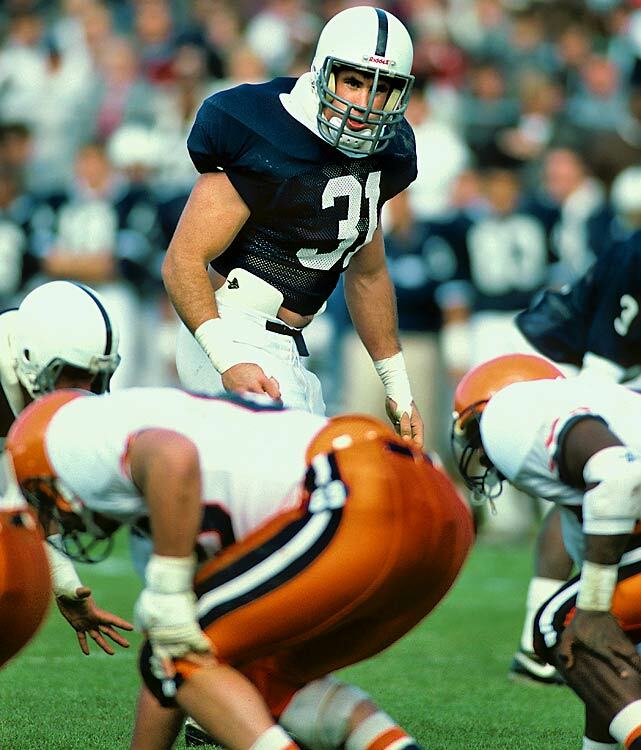 Not since that ’86 season, when the late John Bruno was arguably the Fiesta Bowl MVP, has a punter meant as much to a Penn State team as Blake Gillikin. An invaluable weapon all year in the crucial battle for field position, the true freshman’s heady dash to track down an errant snap and prevent an Ohio State touchdown meant just as much to his team and its season as any time Bruno pinned the Hurricanes deep that night in Tempe. Penn State’s last outright Big Ten championship came in 1994 (Ohio State earned a share of the 2005 and 2008 titles despite losses to PSU), a year when the Lions unleashed a potent, score-from-anywhere offense. With Trace McSorley playing a more mobile Kerry Collins and Mike Gesicki a rangier Kyle Brady, Joe Moorhead’s group made a fair impersonation of that legendary crew from ’94. But then, as now, the running game powered the juggernaut, and sophomore sensation Saquon Barkley is the team’s most superb tailback since the electrifying Ki-jana Carter. And not since ’94 (and maybe even then), when Carter was joined by Mike Archie and Stephen Pitts, has State enjoyed an assemblage of backfield talent like the current crop of Barkley, Andre Robinson, Miles Sanders, and Mark Allen. An early season clash with Temple this year marked the 50th anniversary of Penn State’s 1966 opener against Maryland, which commenced Joe Paterno’s head coaching career and brought his first of 409 career wins. But one win this season managed to reach even deeper into the memory bank, back to the days of Rip Engle. The 2016 campaign went to another level when an unranked Penn State upset the number two team in the nation, duplicating a feat the Lions had accomplished only once before, also against the Buckeyes in 1964, except that time in Columbus. It should be noted that the connection did not go entirely unnoticed in the lead up to the game (and if damage from the post-game celebration this year was disappointing, at least nobody dumped a car into the duck pond at Hintz!). Echoes of the past, but with a twist. Appropriate for a season that opened the door to reclaiming the program’s cherished history while simultaneously launching it into a new epoch. But for the whims of a fickle playoff selection committee, the Big Ten champs could have joined their counterparts from 1978, 1982, 1985, and 1986: Penn State teams that finished the season with an opportunity to capture the national title by winning it on the field. Instead, group them in with the ’68, ’69, ’73, and ’94 squads that staked a legitimate claim on championship contention, but for various reasons, lacked the chance for a decisive game (the wisdom of 1994 New York Times computer analysis notwithstanding). What’s exciting now is the chance that they’ll be back – and soon. Unlike the memorable squads of 2005 and 2008, this year’s team does not represent a “last, best shot,” an all-or-nothing opportunity for a senior-laden roster to leave its mark with an unforgettable final act. In one other important way, this season reminds us of those past: In the talent that returns or is soon to arrive via recruiting, the current state of Penn State football recalls the halcyon days when Joe’s teams would reload, not rebuild. Even as it rekindled memories of a rich legacy, 2016 also brought with it promise for the future.